Came across a great article by Keith Stuart at guardian.co.uk posted Sept 2010. This is the direction I would love to see the development of textbooks and novels used as prescribed texts go. I think I have said - it would be impossible to stop them from reading with this sort of interactive and immersive experience on offer.
" What impact will digital books have on the experience of the written word – apart from the form factor, and the ability to store hundreds of works on a single ebook reader? Will the rise of gadgets like Kindle and tablet computers like iPad actually contribute to the medium in a creative way? An interesting piece last Thursday from Gregory Ferenstein at Fast Company highlights some of the benefits of the iPad 2 in the classroom. 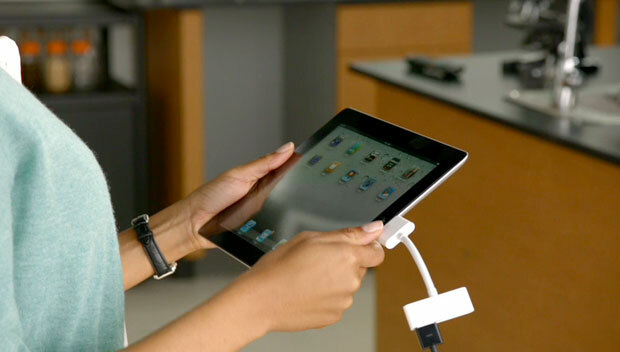 The iPad 2's wealth of new features is a boon for tech-hungry classrooms. Education isn’t restricted to just peers within the same school. For language learning,Marquette uses Skype to connect nascent speakers from different countries. Finding a partner school will likely be even easier with Skype’s new online community for teachers. In the near future, lectures will become the homework. The Gates and Google funded Khan Academy found that lectures were more effective when students could listen to and replay lectures at their own pace at home. The iPad's video capture feature will allow teachers to join the movement by pre-recording their lectures as homework the day before a new classroom topic. 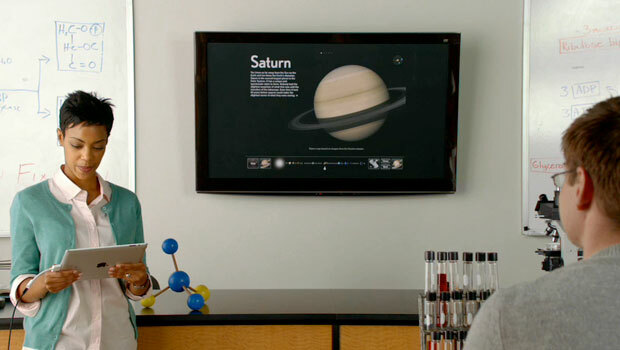 Additionally, teachers could hold virtual office hours from anywhere in the world. "Bringing iPods and iPads into the classroom is a great way to give students access to learning tools. However, there are so many things to keep in mind to make the devices work smoothly in the classroom. While this list of dos and don'ts mainly addresses iPod touch the same advice goes for iPod touch and iPhone. Do sync all iPods to one computer. You'll really be doing yourself a favor by syncing with one computer. 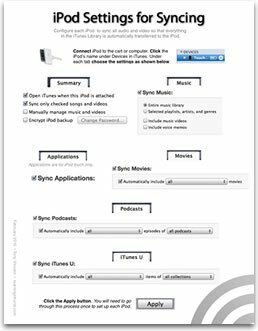 You can add media to one computer's iTunes Library and know that it will sync with all iPods. If you must use more than one computer for syncing, always sync the same group of iPods to the same computers. This will probably involve color-coding the iPods and computers. The one computer you sync with can be Windows or Macintosh. Some people report that Windows computers freeze when syncing more than a few iPods at once. Macs appear to work better at syncing multiple iPods simultaneously. Do name iPods. The first time you sync an iPod you are prompted to give it a name in iTunes. 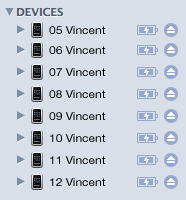 Start the name with a number so iPods are listed in order under the Devices list. Include a zero in front of number 1-9 so the computers sure to list them correctly. You can always change an iPod's name anytime using iTunes. Do set each device's wallpaper with a number or name. An innovative way to identify iPods touches is to set the wallpaper image of each device to include its number or a name. This way you can simply press the Home button and the screen instantly lights up and displays the device's number. Wallpaper can be any image that's in the Photos app. That includes images synced using iTunes or images saved from mobile Safari or other apps. I've made three sets of images that you're welcome to use as wallpaper. Read my post and download the image sets. Do set iPods for automatic sync of all content. Configure each iPod to sync all audio, video, podcasts, and apps so that everything in the iTunes Library is automatically transferred to the iPod. This way there are no buttons to push or click. Simply plugging in the iPod will ensure that everything in the iTunes Library is synced onto the iPod. Refer to this PDF for directions. Each iPod will have to be configured separately in iTunes. But, once configured, you won't have to touch the settings again. Do label or engrave iPods. It's important for teachers and students to be able to identify iPods. Giving iPods numbers is helpful. Some schools engrave numbers on the iPods' backs. Unfortunately, this number cannot be seen when the iPod is in a protective case. Putting a sticker on the front or writing the number on the case is helpful. Be sure the number matches the number you gave the iPod in iTunes. Additionally, having a variety of colors for cases can make it easier for students to spot their iPods. Do use a flash drive to transfer apps between computers. When you purchase an app in iTunes it is downloaded and stored on your computer's hard drive. That same app file is then copied to all iPods that sync with your iTunes Library. There might be times you download apps on a computer other than the one you use for syncing. In this case you will need to copy the apps from the original computer's Library onto the new computer for syncing with iPods. The easiest way is to use a flash drive. On the first computer click Applications under Library. Then drag and drop the apps you wish to copy onto the flash drive. They appear as .ipa files with an iTunes icon. Eject and insert the flash drive into the computer used for syncing. Drag the apps from the flash drive into the iTunes Library. 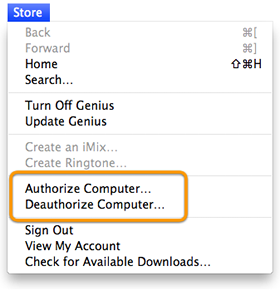 If the apps were downloaded or purchased under a different iTunes account than the one on the syncing computer, you may have to authorize your account (see above). 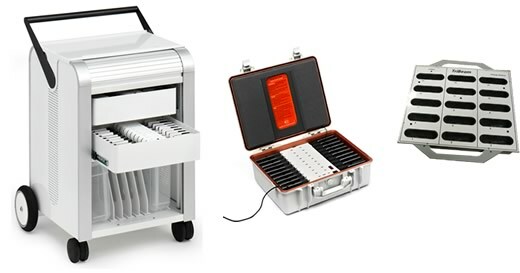 Do get a charging cart, case, or tray if you have the money. Bretford makes thePowerSync Cart for iPod. It's pricey at about $2300. For about half the price they offer thePowerSync Case. TriBeam is another company that makes carts and trays for syncing iPods. Also, PARAT Solutions makes Parasync, and they have created a product comparison chart. An advantage to these solutions is that each iPod has its own slot. Numbering these slots allows the teacher to quickly see which iPods are missing. If you cannot afford a cart or case, do buy a couple of powered USB hubs so you can sync and charge several iPods at once. If you stagger connecting the iPods, you can sync and charge an entire class set without buying expensive equipment. Do have earbuds for each student. Something else that isn't fun is using earbuds that someone else has stuck in their ears. 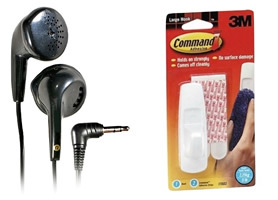 You can get inexpensive earbuds at Walmart andonline. Most students probably already have their own earbuds. Earbud wires do tend to get tangled. Those in elementary classrooms may consider putting a hook on a wall for each student. Label the hooks and earbuds so students can drape their earbuds from the hooks when not in use as a way to keep the wires tangle-free. Do use a URL shortener. If you don't have a class website or don't have time to update it, give wen addresses for students to type in using a URL shortening service. Sites liketinyurl.com and bit.ly take longer web addresses and make them shorter. The shorter the URL the easier they are to type on an iPod touch. Read more about shrinking long web addresses. Do set up email.. Like it or not, email is the primary way to get some information off the iPod and onto a computer. If students are assigned their own iPods, then it makes sense to set up each iPod with the student's email account. Some schools use Gaggle.net email, which can be configured to work on iPod touch. If students do not have their own email or students share individual iPods, you may want to set up each one with a free Gmail account. The problem with setting up all those accounts is the time involved and the difficulty in monitoring so many accounts. 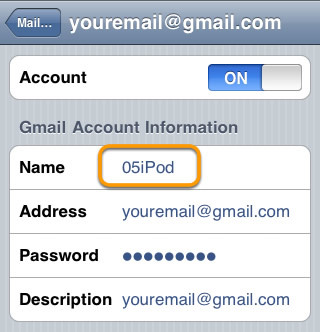 An alternative is to create one Gmail account to be used on all iPods. 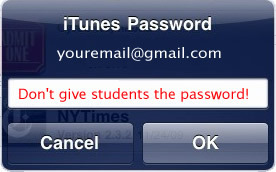 So that you can tell which iPod an email originated from, type in the number of the iPod or the name of the student in the Email settings Name field. This will need to be set up individually on each iPod. Additionally, be sure the teacher's email address is added to the address book so students can easily send what they create on the iPod touch to the teacher. Don't feel you need to sync iPods everyday. Chances are you won't need to sync iPods everyday. 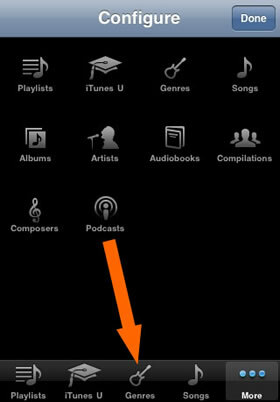 You only need to sync when there are new podcasts, audio, video, or apps you want to put on the iPods. If you plan ahead, you can make it so syncing is required only weekly and perhaps monthly. Depending on use, however, iPods will probably need to be charged every couple days. Don't spend too much on iPods. The 8GB iPod touch is the most affordable. Is 8GB enough? For most, yes, 8GB is plenty for dozens of apps, lots of audio, and a few videos. You can see how much of the available memory is taken up by viewing each iPod's capacity gauge. The gauge is found in iTunes under the Summary tab for each iPod. Don't buy expensive accessories. Apple sells $30 earbuds with microphones, $30 cases, $20 syncing cables, and $30 wall plugs. Monoprice sells $4 earbuds with microphones, $1cases, $2 syncing cables, and $4 wall plugs. Don't mistreat batteries. iPods use lithium-ion batteries. These batteries will lose capacity over time. The worst thing you can do is store iPods somewhere hot, like a car in the summertime. It's also not healthy for lithium-ion batteries to be completely discharged. 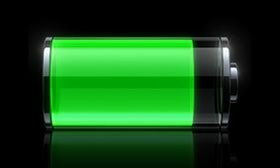 For healthiest batteries, store iPods at about 80% charge over the summer (be sure to completely power down the iPods over the summer as well). Don't use liquids to clean the screen. You don't want liquid getting inside. Microfiber clothes clean the screens nicely. If the screen is really gunky, put a small amount of water on a cloth and then clean the device. Don't forget professional development. There's always something new to learn when it comes to teaching and learning with iPods. Consider booking a workshop with me, Tony Vincent, and my workshops can even be attended by students. Don't forget that I offer apodcast for iPod-using educators. Additionally, there are plenty of other great websites out there where educators are sharing their iPod touch activities, ideas, and resources." From TechLearning.com - An intelligent and reasoned argument by Dean Shareski about not whether the iPad is suitable to education BUT how the iPad and the expectations that come with them are changing the ways that we think about using technology in the educational setting - What are the new Possibilities? I’m not usually one to write about a tool or software but an interesting shift is occurring in the district where I work. The iPad is generating more discussion about the role of technology in learning than any tool or event to date. In trying to understand the reason for this, I’m of the belief that the design and tactile experience of the iPad are the primary differences in this device that is enabling these conversations. The buzz is more than simply an interest in a cool tool but an inquisitive and curious attitude built around new possibilities. I’m not sure what it is but the simplicity of the apps seems to get people considering what apps might exist and what apps need to be created. The other thing about these devices is that they are all about customization. Most desktops and laptops do not encourage people to do much beyond using the software outside of the default installation. The average user doesn’t seek to tweak and tinker. The iPad is all about tinkering. While many would argue against it as purely a consumption device, the addition of a camera, creation software such as iMovie and Garageband, as well as keyboard enhancements means it offers some of the best creative applications for education. This isn’t really about the iPad as much as it is making computing easier. Those pioneers of educational computing such as Seymour Papert and Gary Stager argue for the transformational use of computers. Computers should be imagination machines. The conversations I’ve had recently with teachers and administrators suggest, they are beginning to see more possibilities. It’s making it very easy to advance the conversation to consider how technology might make learning different. Partly it’s due to the fact that everyone seems to be on a level playing field. There is no iPad curriculum, at least not yet, I hope never. Much like the Hole in the Wall experiment, everyone seems to sense, there’s something interesting here and are willing to explore and play. That exploration is naturally facilitating conversations I’ve not seen generating before. Another reason there is increased conversations is because the form factor allows users to more easily manipulate and “own” the device. No longer are users dependant on a keyboard and mouse as the primary input device but can have a more intimate experience with content and ideas. The keyboard served as a prosthesis, the iPad and other touch devices eliminates the middle man. Teachers are asking about how to create content for the iPad. The epub format in particular has enormous potential. The development of homegrown textbooks is within grasp. These possibilities have indeed existed for years. Open source software offered similar hope but for the most part, the learning curves were not overcome by the masses. Those who have been the creators and makers using technology are generally the ones who have persevered and were willing to put in the time to be successful. Beauty and quality will still take time and sweat to create but I believe the iPad represents new hope more than ever before. At least I hoping so. Note - If you will be traveling to MEC in Tempe Arizona or CUE in Palm Springs California this March 2011 please introduce yourself at one of my sessions. I am making the trip from Indiana and will have two presentation at each conference. They include Digital Immigrants and Digital Natives... No Future Left Behind, STEM to STEAM to STEAMIE... Turning Up The Temperature, and A 7 Step Approach to Website Evaluation... A-G.
Several weeks ago I reviewed one of the most powerful iPad app sites on the web. If you missed the posting be sure to give this prior post a visit. The website iEar is an amazing site based on both teacher reviews and contributions. You may just want to become a member of iEar today! Again, check out this prior post for link and information. Perhaps you want to discover even more apps for your classroom iPad. Then read below and discover ten more sites that will bring out your need to keep filling the memory chip of your iPad, iTouch, or iPhone! 1. The iPhone Application List – While this site has numerous categories for apps, I have directed you to a portion of the site that contains about 100 apps both free and for purchase. You can select between free and paid. Each app is click-able allowing the reader to view description, posting date, and a link to the download. 2. The iPad Pilot Project – A page filled with resources and so much more. This wiki has categories you will want to explore. There are three separate links leading to apps for elementary, middle, and high school. Don’t stop there! Make sure you explore other links including digital textbooks, challenges and successes, setting up carts, mobile management, other school districts, and articles/blogs. Also make sure you visit eMobilize (a sister site) where you will learn about mobile computing standards, curriculum, logistics, management, and use/care. The iPad pilot project is sponsored by the Department of Educational Technology in the School District of Palm Beach . It is administered on the department’s wiki by John Shoemaker, Melissa McBride, and John Long. 3. The iPad In Education – A great site based in the United Kingdom and administered by Ian Wilson, a freelance Apple Distinguished Educator. When you visit the site be sure to have some extra time to visit all of the links. The pages, listed by subject area, provide a large number of useful apps for teaching and learning. Categories include Apps - includedwith the iPad, Artwork, Geography, History, Literacy, Miscellaneous, Numeracy, Music, and Productivity. The United Kingdom “iPad In Education” is a must visit for those wanting to learn more about the iPad, its apps, and ways to deploy it in the classroom. 4. Teach With Our iPad - Have you ever been to one of those sites that was so filled with resources, you didn’t know where to begin! I suggest that you begin by just visiting this site. It really is so much more than an awsome collection of iPad Apps. You may wish to start with iPad Apps and its listing of over 500 apps, descriptions, reviews, and even apps to get started with. Or, instead, begin with the searchable data base or take a look at their cool list of projection apps. 5. The iPad Schools - This wiki is intended to be a clearinghouse of applications, lesson ideas, and experiences using the iPad in the classroom. The intent of this wiki is to give a listing of apps that have been tested and recommended by teachers who are using them. The listings in this wiki are generally created using google docs and members of the wiki are invited to update and add information. I especially like the Creativity Apps, Teacher Tools Apps and the VGA Output Apps. You also may wish to check out Managing a Classroom Set of iPads and This is what I did… (which is a selection of the authors’ reflections and practical applications. 6. The iPad Curriculum – This website is a blog with in-depth articles relating to the iPad. 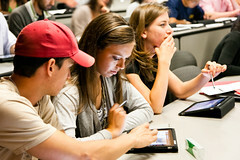 It claims to be a collection of the best in applications, practices, and deployment of the iPad as a learning device. Upon reading, you’ll find the blog does give some excellent in-depth articles about apps, deployment, and uses. One of my favorites on this site helps innovative teachers write their own app using edupad without the need for code knowledge. A clever data base search engine that involves steps of Bloom’s Taxonomy is especially useful. While the site is relatively new, the archive dates to July 2010, it seems that this blog holds some great promise for iPad users. 7. AppAnnie – The link included brings you to the educational listings for this web site. Note that it lists about 200 educational apps which are click-able with a description and also note whether they are free or entail a cost. Visitors will also notice a button that will deliver a new page with 500 iPhone educational apps. If you are an app developer you may want to investigate the app nanny. This service provides an App Care web service for iPhone app developers, helping them keep tabs on their apps. It’s free during the open beta. 8. ACALANES Union HS – This Google Site is maintained by dedicated people at a high school integrating mobile learning for their students. The link will bring you to 75 apps available for the iPad and education. 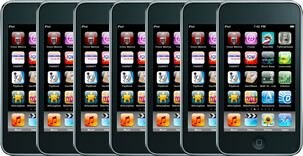 Take another look and you will find a link that will provide 210 integrating apps for the iPod Touch. There is still more, how about an area dedicated to learning how to write an ebook with and for the iPad. 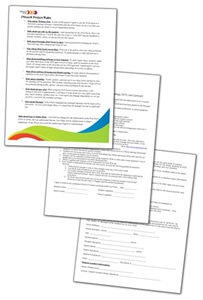 Information includes using Google Doc Mobile, using Pages App on the iPad, or integrating with Google Docs on the computer. Last, be sure to visit the “Ideas For iPads” Slide show for some great ideas! 9. Apptivities - The website defines apptivities as, ” models for successful instructional practices with mobile devices”. This is a unique site in that it is the application of apps that creates a transformation in learning. Various apps are covered by offering suggestions of ways to use them in the classroom. There are even video examples to help further educator understanding. Apptivities is the response to a challenge given at the ADE Summer Institute 2010 at Full Sail University, Orlando, Florida. ADE colleagues contribute apptivities, a specific learning activity using apps on mobile devices. A key part of the vision for apptivities is to provide media resources that give a “view” into best practices in the classroom. You can even help support the challenge of supporting teachers in using mobile applications effectively to improve student learning. A link for action will allow you to contribute your own apptivities. 10. Apple Ipad Site - Did you really think I would forget the company that made the iPad possible? This link brings you to a site where you will find all of those apps listed by category. 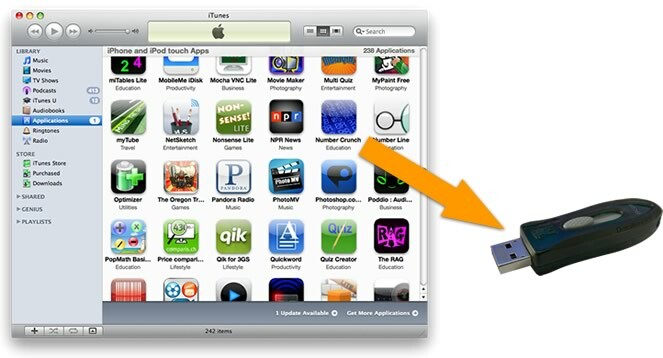 You will find a large listing in the apps iTunes store. While you are at it, you may wish to learn about Apple app volume purchases.